Ghanaian midfielder Brian Amofa has joined Swiss side FC Sion on a five-year contract. The 19-year joins from French side Racing Strasbourg, where he refused a contract extension. The relatively unknown midfielder was born in Strasbourg in France, and is available to play for Ghana due to his parents. He will have an European experience with FC Sion who are due to face Celtic of Scotland in the UEFA Europa League play-off. Ghanaian Olympic star, Abdul Aziz Tetteh has signed for Spanish Segunda outfit Montaneros on a season-long loan deal from Italian giants, Udinese. The move is to afford the midfielder regular playing time after failing to break into the first team of the Zebras. It will be third consecutive time Tetteh has been loaned out since joining Udinese in 2008. He was farmed out to Xerez in Spain in 2009, before spending last season at Granada and Leganes. Tetteh was part of the Ghana Olympic team that beat Nigeria to qualify for the 2011 All Africa Games. Ghanaian defender Adnan Saeed is on a week-long trials with South African elite side Moroka Swallows. The 20-year old is looking forward to impress Birds coach Gordon Igesund in return for a permamnent deal. The relatively unknown defender played for Ghanaian side Wa All Stars during the just ended season. The Birds are hoping the experience of the central defender will solidify their options at the rear. Saeed is on trials alongside compatriot Edwin Gyimah, who is with BidVest Wits. Gyimah was a member of the Ghana team that participate at the African Nations Championship (CHAN) in Sudan last February. Vitesse Arnhem has signed Anthony Annan on a seasons loan from Schalke with an option to buy.Anthony Annan will arrive in Holland today to finalize the deal. Ghanaian youngster, Christian Atsu has been loaned out to Portuguese top flight side, Rio Ave from champions FC Porto. Ghana youth star, Quincy Osei has joined Serbian elite division side Hajduk Kula on a three year as a free agent. The 21-year old midfielder sealed the move on Thursday after passing a medical with the Kula-based club. The player is said to have earned the attention of Hajduk Kula coach Nebojsa Vignjevic during his month-long trial. Osei recently saw out a two-year stint with Haka FC of Finland, where he carved a niche for himself as one of the best performers at the club. The midfielder was a member of the Black Meteors squad defeated by Sudan in the qualifying rounds for the London 2012 Olympic Games. He is the only African player in the set-up of Hajduk Kula, one of the oldest clubs in Serbia. Ghanaian midfielder Mubarak Wakaso has extended his stay with Spanish La Liga outfit by signing a three-year contract. The new deal ties the 20-year old to the UEFA Champions League campaigners till 2016. 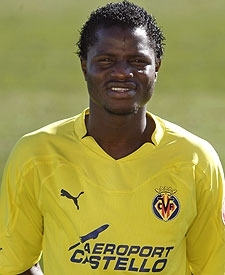 Wakaso has made his way into the first team of Villareal since joining them during the second halve of last season. He joined from Spanish Segunda B side Elche. Wakaso has had stints with the Ghana U-17, U-20 and Olympic teams. Prince Tagoe has reportedly been signed by Turkish side Bursaspor.The terms of the deal are undisclosed. Tagoe moved from Hoffenheim on a loan stint with Serbian club Partizan last season. David Addy has joined Greek side Panathinaikos FC on loan until the end of the season. The Ghanaian defender completed the move on Wednesday's transfer deadline day from Portuguese side, FC Porto. Addy, 21, is contracted to Porto until the 2013 season but has found first team opportunities hard to come by under Victor Pereira since returning to the champions from Académica de Coimbra on loan. Last edited by Pope Bitterz D'Alomo; 2nd September 2011 at 08:31 AM. Ghanaian-born defender Davidson Drobo-Ampem has joined Danish side Esbjerg fB on a season-long loan deal from German side FC St. Pauli. The 22-year has been transferred to the Danish side after failing to break into the St. Pauli first team upon his return to the club this season after a loan spell with the same club last season. 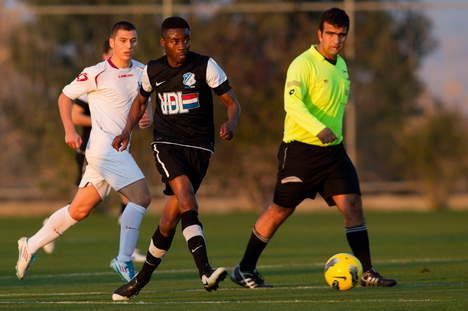 Drobo-Ampem will return to his mother club in the summer of 2012. The central defender has been playing for St. Pauli since 2009 after graduating from their youth set up in 2008. Ghana striker Matthew Amoah reached an agreement on Monday to sign for newly-promoted Turkish Super Lig side Mersin Idman Yurdi for three years. The 30-year-old moves from Dutch Eredivisie side NAC Breda where he has played the last five years. Barnet have signed ex-Ghana striker Lloyd Owusu on a short-term deal. The 34-year-old signed for Luton in January, scoring six times in 13 appearances before he left in May. Owusu began his career at Slough, moving to Brentford in 1998 where he scored 70 times in 195 appearances during a four-year spell. He went on to play for various clubs including Sheffield Wednesday, Cheltenham and Reading, before moving to Adelaide United in December 2009. 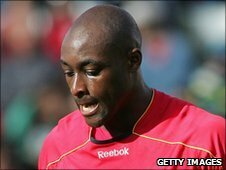 The Slough-born player, who won two caps for Ghana, has been brought in by Bees boss Lawrie Sanchez following Jason Price's move to Morecambe. Ghanaian Bright Christopher Addae has secured a work permit that will enable him to play for Italian Serie A side Parma. Ghana international Samuel Yeboah leaves Belgian giants Genk by by mutual consent. Yeboah has had his contract cancelled after one season with the side. The 25 year-old joined the club in January 2010 from Hapoel Tel Aviv, signing a three-year deal until June 2013 but was loaned to Beitar Jerusalem last season. South African giants SuperSport United have agreed terms to sign Ghanaian midfielder Edwin Gyimah. The 22-year old burly midfielder impressed the technical handlers of the former PSL champions during a three-week trial. However, Gyimah, a member of the Ghana U-23 will be available to the Matsatsantsa next January when the transfer window re-opens. Ghanaian striker Lloyd Owusu has joined English non-league side Hayes & Yeading on a one month loan deal. The 34-year-old moves from Barnet third tier side Barnet. Owusu signed a short term deal with the Bees in September but has struggled to make an impact and has only made just six substitute appearances. The move will be completed on Friday as Owusu, whose Barnet contract expires in January, goes in search of regular football. Dong Bortey, who is already in Vietnam, will soon sign a loan deal beginning 1st November 2011 to 31st August 2012, and former champions Aduana Stars are expected to receive an amount in the region of $30,000 for the loan deal. Former Bechem United star Quincy Osei is playing in Serbia for top flight side Hajduk Kula whom he joined at the beginning of this season on a 3 year deal. He tells ALL SPORTS he is enjoying his game hoping it will serve as the platform for a move to a more lucrative league in Europe. “It’s a very competitive and good league to move to a bigger league in Europe. I’m really learning a lot here and very ready for the bigger leagues. "For now I have signed for 3yrs so I’m concentrating on helping my club go high and hopefully the bigger clubs in Europe can see me from there. I will be happy to land in either England, France, Spain, Italy or Germany,” he told ALL SPORTS from his Serbia base. Having been back home during the last season to power Bechem United to promotion to the Glo Ghana Premier League, Quincy also featured for the Black Meteors in their unsuccessful London 2012 bid. He relishes the experience and is keen on featuring for the national team proper. So does he follow the fortune s of Bechem in the Ghanaian top flight? “Yes very well each week and I hope they start winning,” Quincy said. “Yes I’m always ready to serve my nation"
If he really moves to bigger leagues it will make him more popular and try his earned experiences with Hajduk Kula.. It is a good thing for a player to play with world class players..
Torric joined Trabzonspor as a free agent. He expressed his gratitude to his new club in a short speech before heading out to practice with his new team mates. Ghana defender Lee Addy joined newly-promoted Chinese side Daelin Aerbin on Wednesday. The 21-year-old signed a three-year contract from Serbian giants Red Star Belgrade after completing a medical. "This is a very cordial and harmonious atmosphere. I am very pleased to be a Daelin player," Addy said. "I want Daelin to achieve better results in the new season. I will put in my energy to get the best for the club. "Also permit me to thank the chairman Li Ming for giving me the opportunity to showcase my skills." The defender leaves Red Star Belgrade after just 18 months at the club. Addy will join his new club after the Africa Cup of Nations in Gabon and Equatorial Guinea which ends on 12 February. Former Ghana international defender Eric Addo has ended six months of inactive by signing for Dutch second-tier side FC Eindhoven. Head coach Ernest Faber has snapped up the 33-year-old to replace centre-back Jelle De Bock who is set for a lengthy spell on the sidelines. Addo is a member of the team’s charges at the training camping in Turkey and played his first game for the side on Wednesday in a 3-3 draw with Kartalspor. FC Eindhoven are pushing for promotion to the Eredivisie as they lie second, ten points behind leader FC Zwolle. Addo is no stranger to Dutch football having first played for Dutch top flight side PSV Eindhoven in 1999 when he left Club Brugge. In early 2009 he moved permanently to Roda JC, where his contract expired last summer. Kumorji signed for 3 and half years. He was expected to sign last summer but his Greek bosses were reluctant in releasing him. BYK: "They did not want to release me, but that was not possible financially. There was chaos." DFCO finally managed to get the player for an undisclosed amount. The 26yr old attacking midfielder is expected to bring in experience in a young team. He is alrady being called "Kumo" by the French press. DFCO's coach, Patrick Carteron: "I talked to Michael Essien and he told me about the qualities of that player." 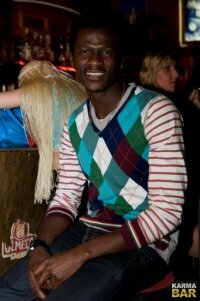 The tall Ghanaian midfielder started his career in Sweden before moving to Greece in 2006 where he played more than 100 games. 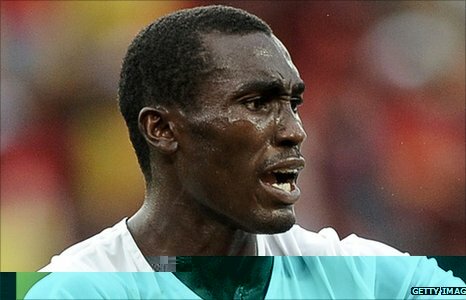 He was a member of the Black Stars that won silver at the Nations Cup in 2010. The second division Greuther Fuerth sign ex-National player: Gerald Asamoah will help to gain promotion to the Bundesliga.With the help of former international Gerald Asamoah Greuther Fuerth the long-awaited promotion to the Bundesliga is finally coming true. They gave the attacker the contract to send a clear message of their intent to the competition. "Gerald will help us realize our dream," said coach Mike Büskens the TV channel "Sky Sports News." Büskens Asamoah knows well, he has with the attacker once the FC Schalke 04 played together before, and was later at the Gelsenkirchen also his coach. "He can help us with his experience," said Büskens. The Fuerth responded with the commitment of the international's 43-times (6 goals) on the loss of striker Kingsley Onuegbu. The 25-year-old Nigerian falls off after a foot operation. Asamoah was also "a robust striker," said Büskens. Anthony Obodai has signed for Magusa Türk Gücü, a turkish club on the island of Cyprus. They play in the turkish league in the northern, turkish part of the island. The 29 year old midfielder has played for Liberty Professionals, Ajax Amsterdam, on loan for Belgian club Germinal Beerschot and Sparta Rotterdam. Obodai began his career in his homeland, starting with SC Adelaide and Liberty Professionals and youth level before moving to Holland in 2001, where he has spent most of his career. He last played for Houston Dynamo in the MLS.